I haven't been cooking much lately folks. Aside from a dandy batch of hot wings I cooked for myself before the football games, the smoker has been relatively quiet. I'm hoping to have the time to cook this weekend. If I am, I'll tell ya'll how it went. Plus, I'm pretty sure I owe you a wrap-up of the Tunbridge World's Fair. Until then, though. Here's some food for thought. I might modify it a bit, giving the shoulder a little more credit for its tastiness. I rarely use this blog for the purposes of spouting strong opinions about anything more than my love of barbecue, but for just a moment I want to climb up on my soapbox and rant. CNN.com has posted an article that highlights the abuse of pigs at a commercial pig farm (http://www.cnn.com/2008/US/09/16/abused.pigs.ap/index.html). As I've read it, members of the extremist animal protection group PETA (People for the Ethical Treatment of Animals) sent "spies" into a hog farm after an internal whistle-blower alerted them to the abuses. They apparently documented a number of nasty practices and abusive habits of the people who run the facility and now the news has gotten hold of it and is waiving it around for all to see. My rant isn't with PETA, although as a group I often dislike their approach and their attitude toward meat eaters. And it isn't even with the abusive and awful treatment the pigs suffered at the hands of their handlers (although I think that is disgusting and disdainful). No, my rant is with the naive and ignorant general public. When articles like this appear in our media, the general public is suddenly shocked and appalled to believe that the animals they eat for food are mistreated. The producers of said meats rush around and say "this was just one case, one rare outlier who certainly isn't the norm!" And the public buys it. That's not the reality, folks. What PETA shed light on is, in fact the norm. I've seen examples of it my own self. See, the problem is that in order for the general public to get their meats as cheap as they expect to get it, corners have to be cut. Factory farming is based on volume and output. Animals are not treated humanely because to do so would force them to have to slow down their process and do things differently - that would cut into their bottom line and it might, god forbid, force them to raise their prices. The abuses the general public are shocked by are the nature of the food production beasts that they feed each day with their money in the big grocery stores. Without a human, personal touch, and a level of respect for the animal, the critters that become our food will lead dismal and horrible lives. The best way to get that human touch, is to buy locally. Get to know your farmer. Find out who they are and what they stand for. Small-scale farmers are better able to care for their animals and give them good (albeit short) lives. This is not to say all small meat producers are good to their animals, but it is to say that you as a consumer have the ability to do your own due diligence and find out for yourself whether the place you buy your meat from treats it with the respect it deserves. I believe strongly in buying locally and getting to know who produces the food I eat. It is the cornerstone of how my family lives our lives. My wife produces food for us and others and she does it with as much caring and respect for the creatures we eat as she can. Likewise, the other farmers we get our food from do the same. I do not have issues with those of us who eat meat. I have issues with those of us who are unwilling to take the time to get to know their food, to learn where it comes from and how it is treated. As a whole consumers determine which companies live and which die by how and what they purchase. So, take some responsibility for what you eat. Take the time to get to know your local farmer. Be willing to spend a little extra for the knowledge that you know where your food came from and how it lived. And above all, be thankful that an animal gave its life for you to eat. Ok, I'm done. Back to our regularly scheduled blog. This weekend's NEBS KCBS contest is the Harvard Fall Festival which, as I understand it is a great little contest. It's held in Harvard Mass on a farm. We've never been, but have heard nothing but good things about it. We have friends who are going - teams Feeding Freindz and Boneyard Smokers, and I can assure you, we'll be thinking good thoughts for them as they try to compete with the regulars on our circuit. Good luck guys! We would have signed up for it this season were it not for a conflict with our favorite local fair - The Tunbridge World's Fair. The Tunbridge Fair is one of those small fairs that still places agriculture and history at the forefront, and to us it's one of our favorite events of the year. Last evening our 10-year old son said that fair time was "just like Christmas!" I couldn't agree more. Although I don't do rides (fair food, centrifugal force and this blogger do not make a good mix), I'm there for two reasons - the sights and the food. I've already made a list of what'll be on my menu over the next few days, and it includes some good barbecue. Pauline and Dave from Vermont Barbecue will be vending, so they're on the list. There'll also be such treats as fired dough and sausage grinders. I won't bore you with the list at the moment, but I'll post a review and commentary from the fair this weekend. Cheers, and good luck to our friends in Harvard! Labor Day weekend officially marked the end of the barbecue season for Farmer Girl and I. We've opted out of a vending gig at the end of the month because we really couldn't afford to make it happen and, to be honest, we're fried from this season. This weekend I gleefully watched the first games of the NFL season while cooking three small pork shoulders and two briskets in the BWS. The off-season won't be slow, though. There's lots more practice to be done before 2009 kicks off. And lots more food to cook! As my summer slips into the distance, I’m finally putting my own thoughts together with regard to our 2008 season. As you read in my previous posts this summer’s barbecue events were marked by the good and the bad. As the leader of our team, I could have found myself in a state of depression regarding my performance. However, the opportunity to take time away from both work and competition has given me the benefit of perspective. The weekend after Harpoon Farmer Girl and I held our annual birthday bash for the 19th year in a row. For those who don’t know, she and I have birthdays that fall three days from eachother, since 1989 we’ve been celebrating our mutual birthdays with a party for friends and family. 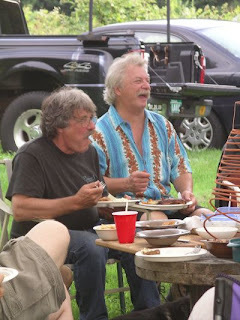 As we laid out our food and enjoyed the company of our friends on August 2nd, I was reminded why I got involved in barbecue in the first place. It’s for these people. I love to cook. And even more than that, I love to cook for my friends and family. When compared to fellow barbecue teams we have a lot to learn, but among our friends and family we’re exceptional cookers with a solid base of fans. In speaking to someone several days after the party, they were still talking about how good the food was. These accolades make our efforts worthwhile. 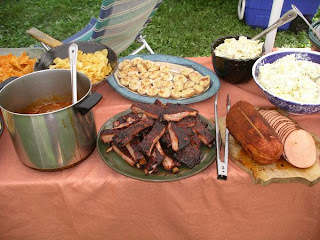 Party meats - Pulled Pork in sauce, Pork Ribs and, Smoked Bologna. Two weekends later, we headed up to Duxbury to run the food tent off of the first hole of St. Divots, the home-made golf course that hosts Old Bull and Mame’s Seven Fires Tournament. This is another party that has been going on for decades and like our birthday bash, the attendees leave impressed with the food and the fun that they’ve all had. This is why we do what we do. The sheer “over-the-top” spectacle of bringing finger foods to the tournament payers is well worth it. During the tournament we handed out multitudes of wings (hot and sweet), slices of steak, smoked kielbasa, flatbreads, sausage and spare ribs. 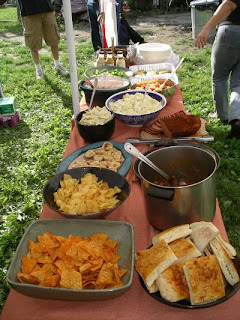 Following the awards ceremony, we presented players with a massive meal that included pot-luck dishes from others as well as my pulled pork, more flatbreads and even a venison. We do this for the laughs and the good times! I think that one of the most enjoyable elements about cooking at St. Divots is that when I arrive, I’m never 100% sure what I’ll be cooking. Obviously, I knew the ribs were going to be served, because they came with me. And, the wings HAD to happen. But other foods show up as donations. For example, Old Bull’s brother brought a couple of good sirloins which got split between folks on-course. The night before the tournament, someone handed us a frozen leg of venison to cook! Farmer Girl does a fantastic job butchering venison (which is the key to making it taste good) and she spent three hours working on it. I was able to throw a pair of nice venison roasts on to the pellet smoker for the dinner crowd – they came out great! These two events, which have been going on for almost twenty years, help define why we enjoy doing this. We do what we do because we love it. We love to cook. We love to cook for our friends. We love to do this and we’ll be back next season, trying our best to beat the rest.